No matter how carefully we plan, every parent experiences at least one diaper blow-out that is beyond inconvenient: while shopping, at a gas station, during a wedding, just before a flight… the possibilities are endless. While many diaper bags are equipped with the basics for emergencies, sometimes you find yourself with a shrieking baby in a filthy restroom, hoping against hope that someone will deliver a magical diaper-changing contraption that will save you. So far, Baby Change-N-Go is the closest we’ve seen to perfection: this portable baby changing station fits into a diaper bag and can be used virtually anywhere. Hang it over any stall door and let it unfold into a sort of secure baby hammock. Baby Change-N-Go can hold infants and toddlers up to 40 pounds and 2 1/2 years old and comes with handy pockets for wipes, extra diapers, or toys to keep baby busy while you change her. Folding it back up is a one-handed job, which is great when you have a little squirmy worm ready for her next adventure (i.e. all the time). Baby Change-N-Go was created by two mompreneurs who have twins, so they know the challenge of finding clean baby changing facilities on the go. Dads will also love this invention since diaper changing stations are often lacking or downright disgusting in men’s rooms. Baby Change-N-Go is crafted from materials free of BPA, lead, and phthalates and can be easily wiped down. Available in pink, blue, or black, Baby Change-N-Go is currently available for pre-orders with an estimated delivery date of end of December 2016. No matter how carefully we plan, every parent experiences at least one diaper blow-out that is beyond inconvenient: while shopping, at a gas station, during a wedding, just before a flight... the possibilities are endless. While many diaper bags are equipped with the basics for emergencies, sometimes you find yourself with a shrieking baby in a filthy restroom, hoping against hope that someone will deliver a magical diaper-changing contraption that will save you. So far, Baby Change-N-Go is the closest we've seen to perfection: this portable baby changing station fits into a diaper bag and can be used virtually anywhere. Hang it over any stall door and let it unfold into a sort of secure baby hammock. 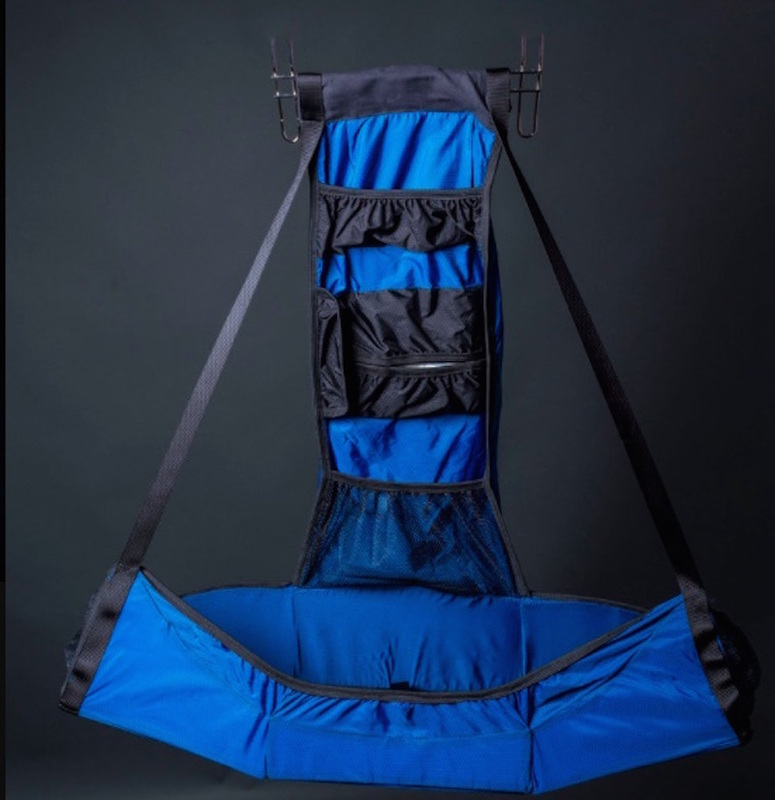 Baby Change-N-Go can hold infants and toddlers up to 40 pounds and 2 1/2 years old and comes with handy pockets for wipes, extra diapers, or toys to keep baby busy while you change her. Folding it back up is a one-handed job, which is great when you have a little squirmy worm ready for her next adventure (i.e. all the time). Baby Change-N-Go was created by two mompreneurs who have twins, so they know the challenge of finding clean baby changing facilities on the go. Dads will also love this invention since diaper changing stations are often lacking�or downright disgusting in men's rooms. Baby Change-N-Go is crafted from materials free of BPA, lead, and phthalates and can be easily wiped down.�Available in pink, blue, or black, Baby Change-N-Go is currently available for�pre-orders with an estimated delivery date of end of December 2016.